When I first got my Apple Watch it was like a new toy and I wanted to use it for everything. I also wanted to try out everything that the Watch had to offer. This included the Breathe app, which periodically give you a reminder to perform a breathing exercise. I used it for the first few days that I owned my watch, but eventually found it to be tedious and disruptive. If you have had a similar experience with the Breathe function on your watch and no longer wish to use it, then you might be looking for a way to stop those periodic reminders from occurring. 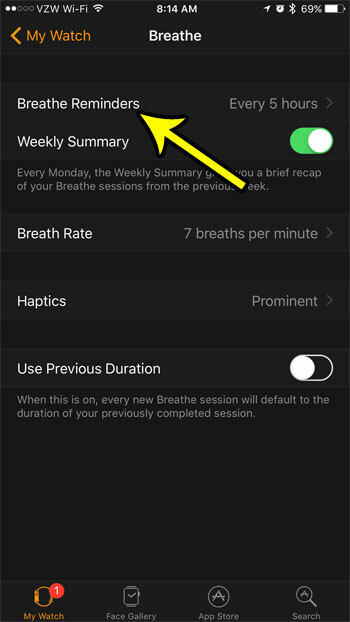 The guide below will show you where to find this setting so that you can stop the breathe reminders from happening on your Apple Watch. The steps in this article were performed on an iPhone 7 Plus in iOS 10.3.2, using the default Watch app. 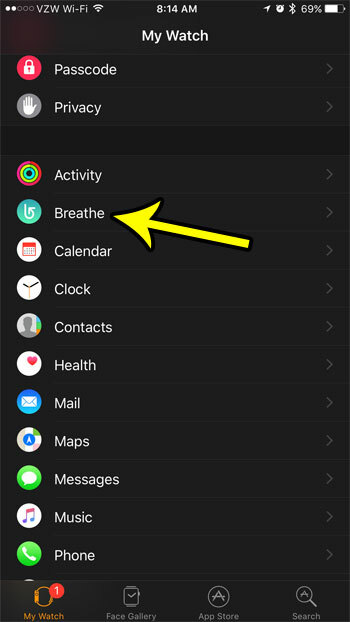 While this article focuses specifically on completely disabling the Breathe reminders on the Apple Watch, you will also have the option to make them occur less frequently. Additionally there are some other options for the Breathe app that you will be able to adjust as well, if desired. Step 1: Touch the Watch app icon on your iPhone. Step 3: Scroll down and choose the Breathe option. Step 4: Touch the Breathe Reminders button at the top of the screen. 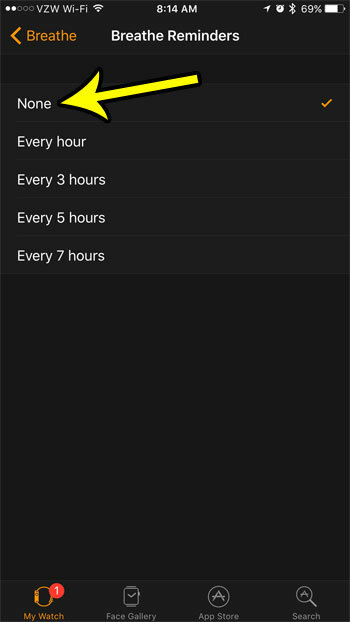 Step 5: Tap the None button at the top of the list to stop all of the Breathe reminders on your Apple Watch. Do you find that you often miss the text message notifications that comer through on your iPhone? Learn how to make the camera flash go off when you receive a text message for a more eye-catching notification that a new alert is available on your phone. What Does Transpose Do in Excel?